The latest figures released by the Australian Bureau of Statistics show that 105,237 people in Australia are experiencing homelessness, with 60% of those under the age of 35. Perhaps surprising to many people is that 44% of these are women, 13% are under the age of 12. These figures in a lucky country like Australia are disgraceful. 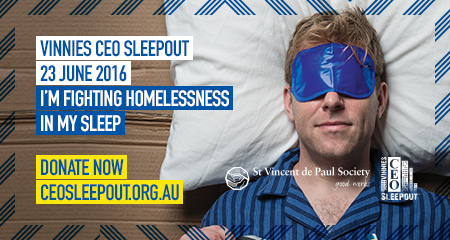 On 23 June 2016 I will join with Brisbane’s community leaders and CEOs to spend one night on the streets as part of the Vinnies CEO Sleepout. We will experience homeless life in an endeavour to raise awareness and crucial funds for St Vincent’s homeless services. Last year I raised $1,520.00 through donations from clients, suppliers, family and friends. This year I am aiming to better this amount and hope you will join with me to do so. Please click here to sponsor me and donate to support this great cause.